Celebrate the General's history with this retro West Tennessee Diamond Jaxx t-shirt from our past. This logo was one of our first logos upon moving to Jackson from Memphis in 1998. 100% cotton. Manufactured by 47 Brand. Celebrate the General's history with this retro blue Memphis Chicks t-shirt from our past. This logo was in use from 1978-1997 under the Memphis Chicks branding before the team moved from Memphis to Jackson in 1998 and became the West Tennessee Diamond Jaxx. 100% cotton. Manufactured by 47 Brand. 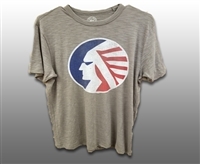 Celebrate the General's history with this retro grey Memphis Chicks t-shirt from our past. This logo was in use from 1978-1997 under the Memphis Chicks branding before the team moved from Memphis to Jackson in 1998 and became the West Tennessee Diamond Jaxx. 100% cotton. Manufactured by 47 Brand. 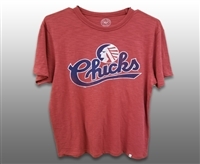 Celebrate the General's history with this retro red Memphis Chicks t-shirt from our past. This logo was in use from 1978-1997 under the Memphis Chicks branding before the team moved from Memphis to Jackson in 1998 and became the West Tennessee Diamond Jaxx. 100% cotton. Manufactured by 47 Brand. Ideal for longer trips, this fishing shirt features anti-microbial properties to keep it fresh and odor-free over multiple wearings. Quick-drying fabric wicks moisture, offers outstanding sun protection, and features plenty of stretch for an enhanced range of motion that's key when casting!